Thu., Nov. 30, 2017, 11:16 a.m.
Line: USC by 3. Series record: USC leads 62-32-3. With the Rose Bowl hosting a playoff semifinal, the winner of the Pac-12 title game will head to the Fiesta Bowl for a premier matchup in a New Year’s Six game. The loser will go to a lower-tier bowl with USC likely targeted for the Alamo Bowl and Stanford for the Holiday Bowl. USC QB Sam Darnold vs. Stanford S Justin Reid. Darnold is one of the nation’s top quarterbacks and had one of his best games against the Cardinal in a 42-24 win in September when he completed 21 of 26 passes for 316 yards and four TDs. The strength of Stanford’s defense is in the secondary led by Reid, who has five INTs, including one against Darnold in the first meeting. USC: RB Ronald Jones. Jones ran for 116 yards and two TDs in the first meeting against Stanford. He has 1,346 yards rushing and 17 total TDs this season, taking big pressure off Darnold. Stanford: QB K.J. Costello. Costello didn’t play in the first meeting but has been improving each week since taking over as starter from Keller Chryst in the beginning of November. He threw for four TDs last week against Notre Dame. Stanford has won seven of 10 in series, including Pac-12 title game in 2015. … The team from the North Division has won all six Pac-12 championship games, including three titles for the Cardinal. … The Trojans are coming off a bye after playing 12 straight weeks, while Stanford has just five days off following win over Notre Dame. … USC WR Deontay Burnett had nine catches for 121 yards and two TDs in first meeting. He needs 34 yards to record the 18th 1,000-yard receiving season in Trojans history. … USC LB Uchenna Nwosu had five of his 13 deflections in the first meeting. … Stanford has won eight of nine following 1-2 start. … Cardinal RB Bryce Love’s 8.6 ypc are highest ever in FBS for player with at least 215 carries. … Love needs 172 yards rushing to break Christian McCaffrey’s single-season Stanford record of 2,019. … Cardinal have allowed six sacks in past nine games. 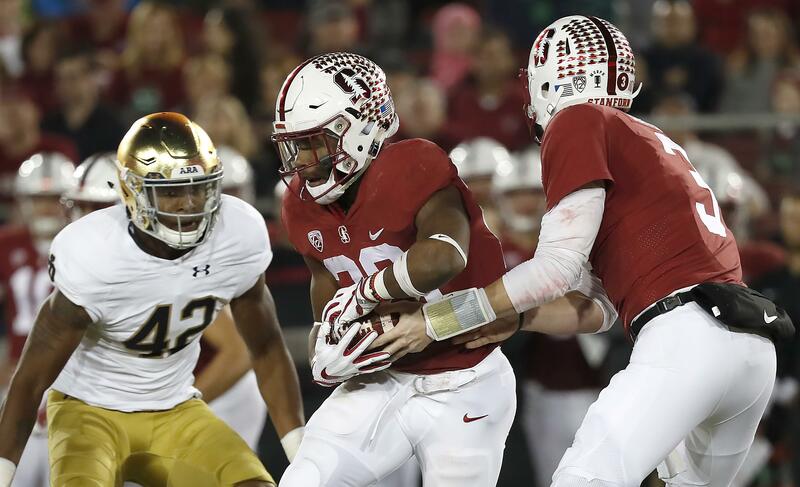 SANTA CLARA, Calif. – The Stanford team that walked out of the Los Angeles Coliseum nearly three months ago after being overpowered by Southern California seemed an unlikely pick to get a rematch with the Trojans. Yet here Stanford is in the Pac-12 title game ready to get revenge against USC for that 42-24 loss in the second game of the season after having won eight of nine games with a familiar formula. An improved defense and the switch at quarterback to K.J. Costello are the biggest differences for the 14th-ranked Cardinal (9-3, 7-2 Pac-12, No. 12 CFP) heading into Friday night’s title game at Levi’s Stadium against No. 11 USC (10-2, 8-1, No. 10). Stanford gave up 623 yards of offense to Sam Darnold and the Trojans in the first meeting, the highest total allowed in coach David Shaw’s seven seasons. USC gained more than 300 yards through the air and on the ground and dominated the line of scrimmage. Stanford hasn’t allowed more than 430 yards or 24 points in a game over the past eight contests. The other big difference has been the switch to Costello, who has provided more of a passing threat to complement big-play running back Bryce Love since taking over for Keller Chryst at the beginning of November. Costello threw four TD passes last week against Notre Dame and is improving each week, the same way the rest of his team is improving. Love has been slowed a bit in recent weeks by a sprained ankle but still is quite dangerous. He ran for 125 yards on 20 carries last week and ranks second in the nation with 1,848 yards rushing while averaging 8.6 yards per carry. He had a 75-yard TD run against the Trojans, one of his FBS-record 11 runs of at least 50 yards this season. Shaw didn’t trust Costello to do much in his first game after taking over as the full-time starter. He went just 9 for 20 for 105 yards in a loss at Washington State. But Shaw has loosened the reins each successive week and even allowed Costello to choose one of three plays at the line of scrimmage on the majority of snaps last week against Notre Dame. Each team enters the game with a potential advantage. After playing 12 straight weeks to open the season, USC comes into this game fresh following a bye week. Stanford played Saturday so it has a short week but gets the benefit of playing this game just a short ride from campus. The team from the North Division has won all six Pac-12 championship games since the conference expanded to 12 teams, including Stanford’s 41-22 win over USC two years ago. That’s a fact not lost on the Trojans. Published: Nov. 30, 2017, 11:16 a.m.